Pillows are often forgotten about when it comes to cleaning. Typically, a person will just throw away their pillows not realizing our Milwaukee dry cleaners will save them a bundle of money. Stop throwing away your money and start dry cleaning your pillows! Our dry cleaning prices are unparalleled compared to the cost of new pillows. The perfect pillow is hard to come by. When you finally find the right ones make them last with our superior Milwaukee dry cleaning services. Unfortunately pillow cases act as a magnet for sloughed skin, mold, mildew, fungus, and dust mites. Our Milwaukee dry cleaning experts recommend having your pillows cleaned every 6 months to keep them sanitary and to prolong their lifespan. Make sleeping enjoyable again with our pillow cleaning and feather pillow cleaning service. 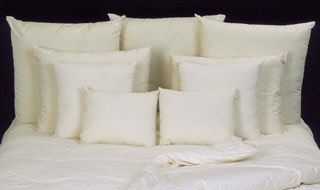 All bed pillows receive a new ticking (outer cover) when cleaned. Martinizing wants you to rest easy on your pillows. Stop by any of our Milwaukee Martinizing locations to drop your pillows off, or schedule a Milwaukee dry cleaning pick-up and delivery today. Contact our Brookfield Dry Cleaners today to have your pillows professionally cleaned for lasting freshness and superior cleanliness.